Before last year I had never heard of Wild Cards. So, for those who may also be in the dark here’s a little background information. Basically, Wild Cards is a series of novels/anthologies set in a shared universe—think of Marvel or DC comics for a perfect example—that was established in the mid-80s by a consortium of writers including creator/editors George R. R. Martin and Melinda Snodgrass, and over the years has featured an impressive cast of contributors such as Walter Jon Williams, Roger Zelazny (RIP), Pat Cadigan, Howard Waldrop, Chris Claremont, etc. The defining aspect of this shared universe is that it’s much like our own except for one major difference: an alien virus dubbed the ‘Wild Card’ which killed off ninety percent of the people it infected while rewiring the DNA of the other ten percent. Of that remaining percentage, most became mutated freaks, or ‘jokers’, while a measly 1% were granted superhuman abilities. These individuals became known as ‘aces’ and are the focal point of the Wild Cards series. What the creators/writers have decided to do with the eighteenth volume in the Wild Cards universe is treat the book as a launching point for a new generation of readers. In other words, it’s the same world and the same history, but a whole new cast of ‘younger, hipper’ characters. To help usher in this new millennium, first-time contributors Caroline Spector, Ian Tregillis and Carrie Vaughn were brought in to work with Daniel Abraham—wrote a short story for the Wild Cards novel “Deuces Blood” (Volume sixteen)—and veterans Michael Cassutt, S.L. Farrell (Stephen Leigh), John Jos. Miller, Melinda Snodgrass and George R. R. Martin who once again doubles as the anthology’s editor. As far as the format, “Inside Straight” can be described as a ‘mosaic’ novel which means that the book is broken up into different short stories—each written from a different character’s point-of-view—that act as chapters to a single overarcing storyline. In this particular volume, all of the writers with the exception of Mr. Abraham provide a short story—Melinda actually does three of them :)—while Daniel handles the framework opening and closing the novel as well as connecting together the individual chapters with Jonathan Hive passages and ‘blog posts’. 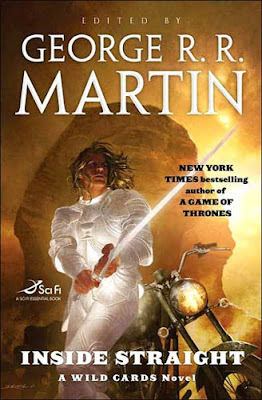 Ironically, the book I just finished reading before this one was “Hunter’s Run”, which was also a collaborative piece that included writers GRRM and Daniel Abraham, so even though “Inside Straight” was my first mosaic novel, I sort of knew what to expect. And to be honest, even though the book features nine different authors, “Inside Straight”—like “Hunter’s Run”—is so cohesively written throughout that the novel almost feels like the work of just one person. As impressive as the book was, I admit that I had a few issues. For starters, I didn’t think the virus was explained well enough. As someone that’s new to the series, I kept wondering what dictated whether a person became an ‘ace’, a ‘joker’ or was just killed in the first place. Also, since the virus originated in 1946, how was it being spread to people born in the 80s or 90s? Plus, why do the manifestations occur at such varied stages in an individual’s life, and what factors determine the kind of power or mutation a person will develop? In addition to this, I was also disappointed with John Fortune’s segment. John happens to be one of the few returning characters in the book and also an ace who apparently lost his power in the previous Wild Cards novel “Death Draws Five”. As a result, one of “Inside Straight’s” subplots was of him trying to regain his gift, which eventually leads him to Egypt. Unfortunately, not much of this backstory was explained which I thought hindered what was in effect an important part of the story. I'm getting this, along with Dragons of Babel by Swanwick and The Book of Lost Things by John Connolly. Connolly btw has the Charlie Parker series which I think you'd really like, it's a supernatural urban Fantasy with an interesting male lead. I finally got a copy of "The Dragons of Babel", but I want to read "The Iron Dragon's Daughter" first, so a review might be a while.